In a recent research paper, former Chair of the Federal Reserve, Mr Ben Bernanke, proposes price level targeting as an alternative framework for monetary policy. Since 2012, the Federal Reserve has had an explicit inflation target of 2% pa, with inflation commonly measured in terms of the chain price index of personal consumption expenditures (PCE), excluding food and energy. The chart below, re-created from Mr Bernanke's paper, shows that this measure has consistently undershot 2% since the financial crisis. At present, the Federal Reserve's inflation target has no memory. Despite the negative deviations from the target over the past decade, the Federal Reserve's mandate does not allow it to consider past shortfalls into account when formulating its outlook for monetary policy. As long as it believes that core inflation will return to the 2% target over the medium term, the central can justify the the current stance of monetary policy. In fact, this represents the rationale for the lift in the federal funds rate over the past year, with the US Federal Reserve expecting factors holding down inflation to be temporary, notably lower import and energy prices. Under Mr Bernanke's proposal of price level targeting, when the federal funds rate is at the zero lower bound, the central bank would be accountable for past inflation misses relative to the 2% target. It would no longer have the discretion to neglect past deviations and would need to make up for past misses. 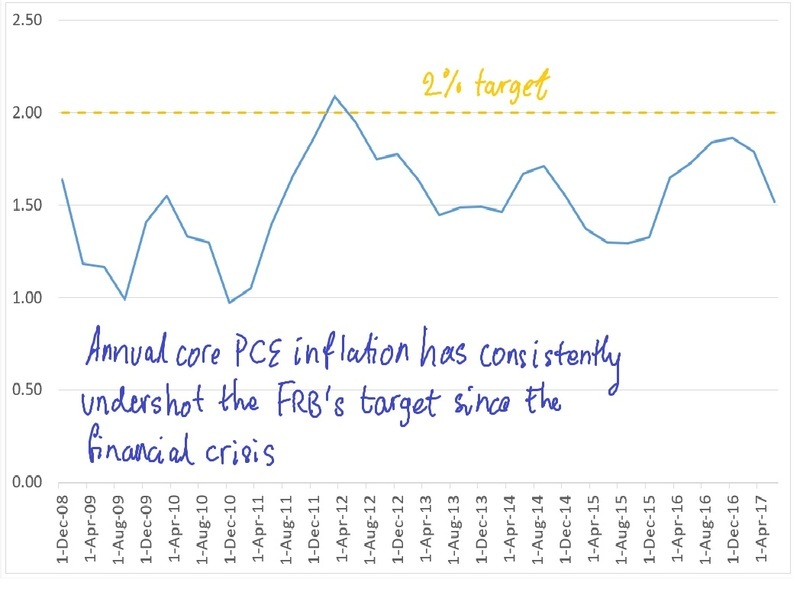 To illustrate, Mr Bernanke depicts the path of core PCE price level since the December quarter 2008 - when the federal funds rate hit the zero lower bound - against a counterfactual price level that grows at the 2% target (see chart). At present, the actual price level stands at 13.8% higher than 4Q2008, below the the 2% target trend which has grown by 19%. The cumulative miss amounts to over 400 basis points. Under the proposed new framework, the Federal Reserve would vow to maintain the federal funds rate at zero until the price level makes up for the past cumulative shortfall. For argument's sake, suppose that the federal funds rate was still anchored to zero. 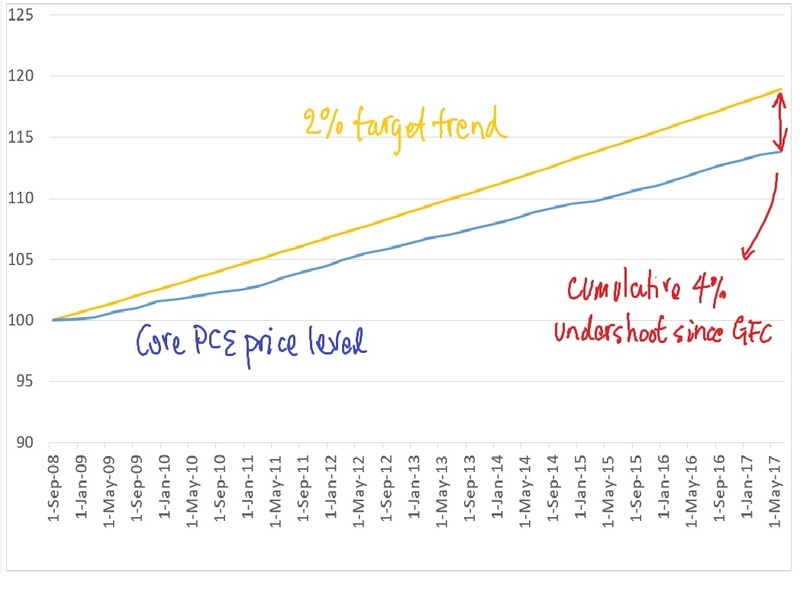 The central bank would then promise to hold its policy rate at this level until the core PCE price level rises by no less than 400 basis points relative to the target price level (bearing in mind that the target continues to grow around 0.5% per quarter). Evidente has extended the methodology and created core price level gap measures for other countries and regions to offer guidance on what a flexible price targeting regime would mean for their respective central banks. The key assumption used for consistency is a common 2% inflation target even though some of these central banks have slightly different targets. Of the small sample, only Australia and the United Kingdom have positive deviations; their core price levels have grown faster than their target since 4Q2008. (see chart). But Europe and Japan have shortfalls that are significantly larger than the United States, suggesting that any moves to tighten policy in those countries would be premature based on a price level targeting framework. 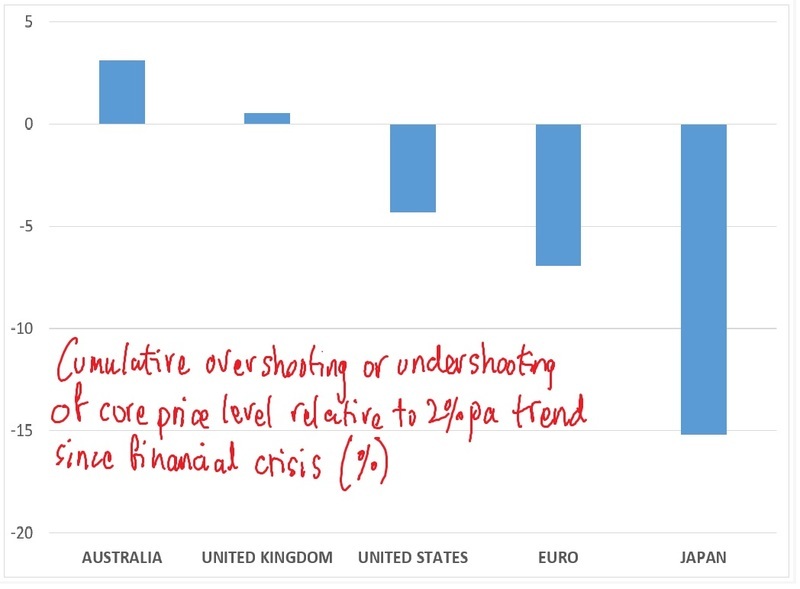 Mr Bernanke acknowledges one of the pitfalls associated with this flexible price level targeting regime; how does the central bank treat deviations from the target price level associated with supply side shocks? For example, a coordinated cutback in global oil production by OPEC and other oil produces could lead to a lift in the general price level above the target level. Strict adherence to price level targeting would see the central bank tighten policy to compensate for past positive deviations, which would further depress activity. A flexible framework of the type that Mr Bernanke advocates, would given the central bank discretion to look through such supply side shocks, but its credibility would hinge on its ability to communicate this effectively to market participants. A debate on a price level targeting regime represents a welcome development in the direction of what market monetarists advocate; a framework that targets the level and/or growth of an aggregate income measure, notably nominal GDP. Nominal GDP has a number of desirable properties relative to overall prices. First, nominal GDP is a better measure of economic well-being because households earn nominal wages and business earn nominal profits. Second, it is not subject to the same mis-measurement issues as overall prices or inflation. Third, demand shocks - which central banks ought to focus on - are better reflected in changes to nominal GDP than prices. Fourth, households mistakenly believe that low inflation is desirable because they focus on what they buy and not what they sell, notably their labour (a point highlighted by market monetarist, Scott Sumner). Against this backdrop, Evidente has developed an alternative policy measure that focuses on deviations from a target level of nominal GDP. To that end, I have estimated a target trend for the United States based on the period 1993 to 2008, and extrapolated this trend out to 2017. 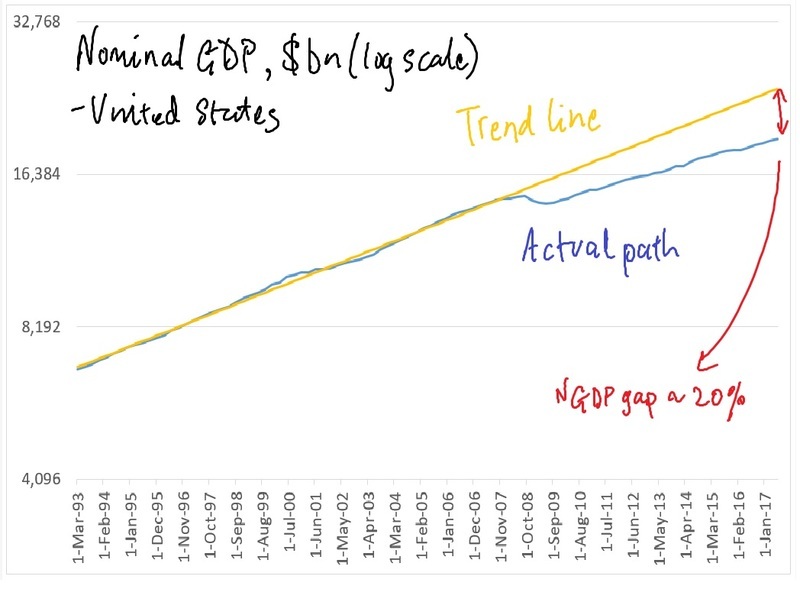 At present, the shortfall amounts to 20%; the economy's counterfactual nominal GDP would be 20% higher if it had grown since 2008 at the same trend rate posted from 1993 to 2008 (see chart). The shortfall has continued to grow and at present, is at its highest level. This framework would suggest that the Federal Reserve should have waited longer before embarking on its tightening process. 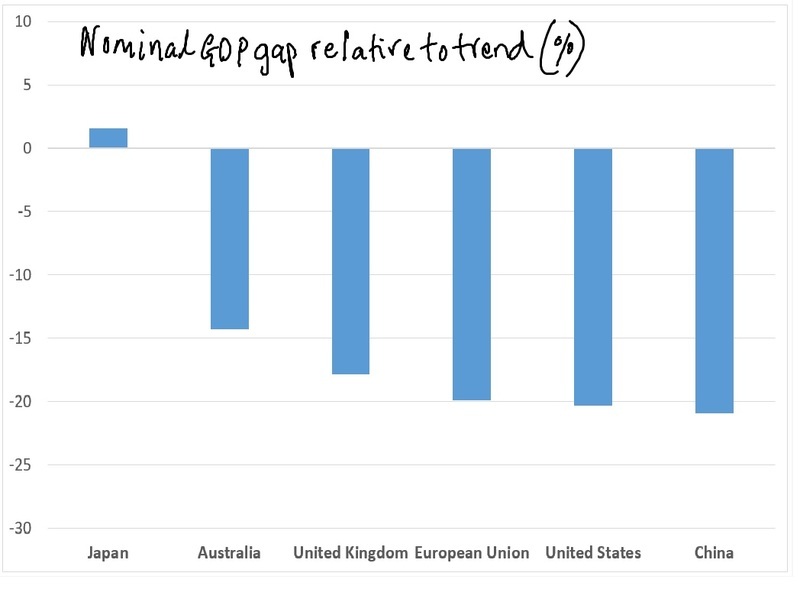 Evidente has extended the methodology to other countries and regions, which shows that the nominal GDP shortfall amounts to 15% or larger for Australia, United States, United Kingdom, Europe and China. Interestingly, there is no shortfall for Japan (see chart). Many would view the conduct of monetary policy globally to be in a state of flux. Many central banks have implemented macro-prudential policies to promote financial stability at a time when policy rates remain close to record lows. On this front, the RBA has been a pioneer, formally adopting financial stability as one of the key objectives of monetary policy. Mr Bernanke's paper represents the start of what is a likely to be a drawn out debate about monetary policy and what it ought to target. Whatever the new central bank standard looks like in the future, one that incorporates level targeting and makes up for past deviations from target would amount to a significant enhancement on the current inflation targeting standard, particularly if policy rates remain close to the zero lower bound for an extended period. Finally, the price level gap outlined by Mr Bernanke and the nominal GDP level gap reported here contain potentially valuable incremental information about the stance of monetary policy above and beyond real or inflation adjusted policy rates. Evidente is currently working on developing a framework that utilises this information to improve measures of expected returns at the market level. In due course, these measures are likely to become an indispensable part of the toolkit just not for central bankers, but also for asset allocators.